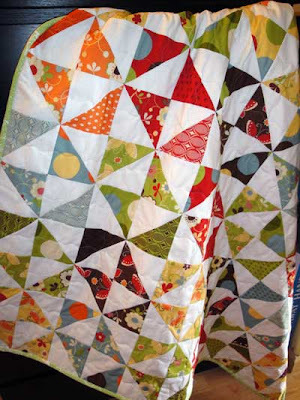 Naming things is not my forte, so for lack of a better name, here is a quilt, "Hidden Pinwheels", that I made for a co-worker's 1-year-old child as an upcoming Christmas gift. It's a belated "congratulations on your new baby" and "Merry Christmas gift" all in one. The quilt measures 48" x 48" and uses Freebird by Momo. 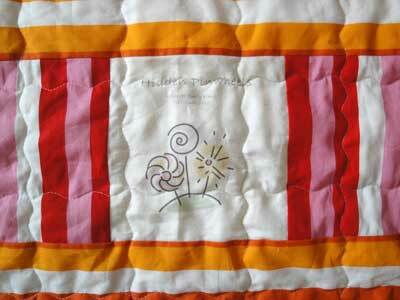 The best part of the quilt is the label that is pieced into the back. Following a tutorial from Hazelruthe on how to print onto fabric using freezer paper and an inkjet printer, I used Adobe Illustrator to design a label and then had no problems making a custom fabric label. 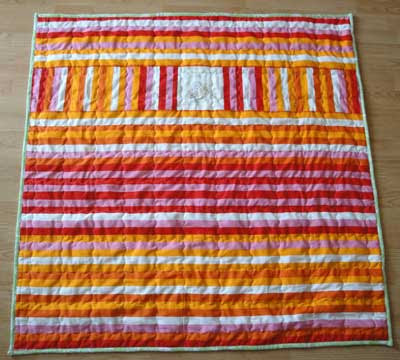 Because I put so much effort into the front of the quilt, I usually get really lazy in making the back, but this one turned out just fine I think.